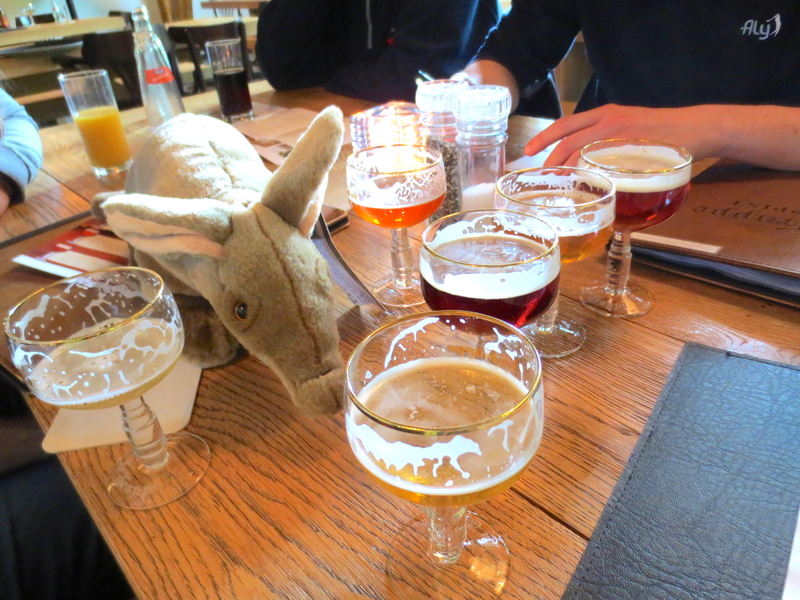 Artie Aardvark’s Belgian Beer Adventure- Part 1 | Where is Yvette? 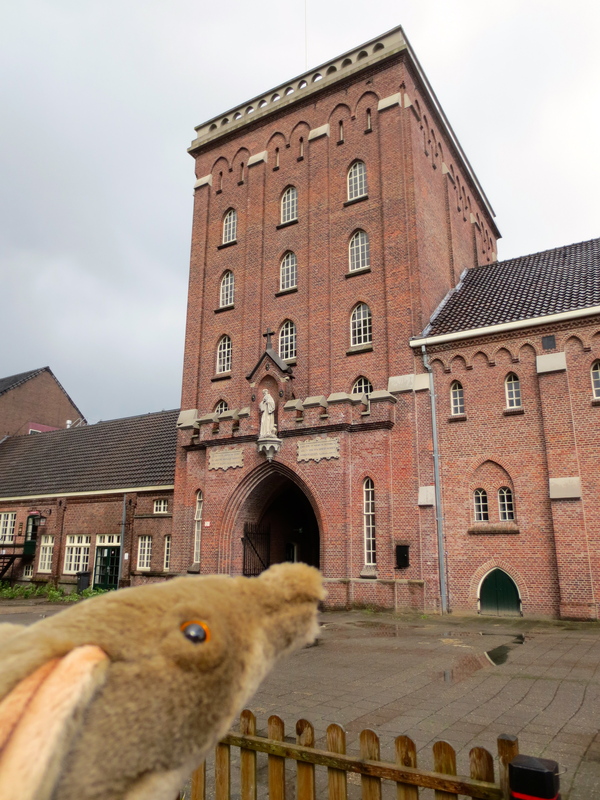 When visiting here I learned that a “trappist brewery” means a brewery where the beer is brewed by monks who still live in the monastery (though in some like La Trappe they now get helped by non-monks in brewing the beer). A lot of people think Trappist beers are the best in the world, so I had a good time trying my first ones! La Trappe makes lots of different beers, like the dark dubbel and strong tripel that are usual Belgian beers, but they also made special ones like a white beer and a quadrupel that was very strong so I only tried a little of it. I also learned while I was at La Trappe that there are only eight Trappist breweries in the world, six in Belgium and one in Austria and one in the Netherlands! So they really are rare and special! 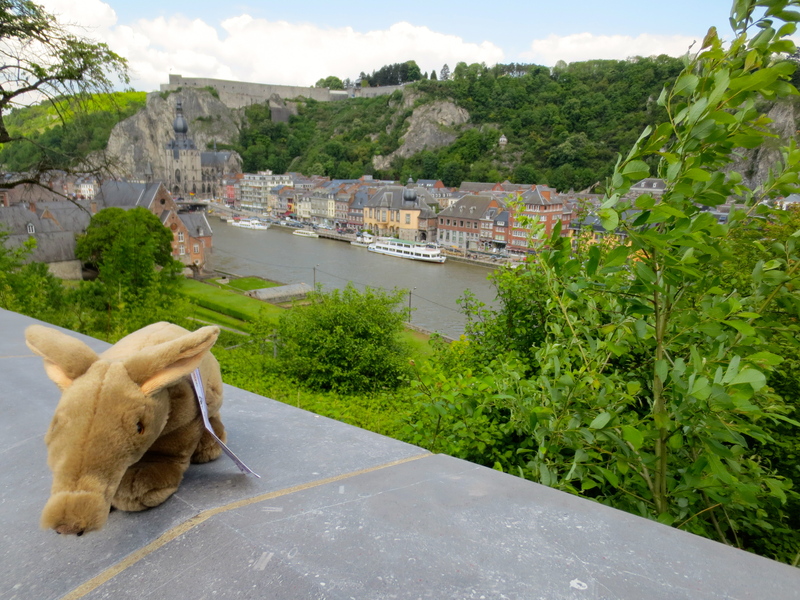 We followed the really nice river and hills all the way to Dinant, home of Masion de Leffe. Leffe is not a Trappist beer but they do brew a lot of tasty beers in an old monastery building, and I even got to sign the guestbook! Also, it’s called Masion de Leffe because we were in the French part of Belgium- apparently the northern part is Dutch speaking, called Flanders, and the southern part where they speak French is Wallonia. It was a good thing we had a French astronomer with us, else things would’ve been a bit more complicated since no one really spoke English or Dutch. It seems strange that in one country there are two groups of people who can’t even talk to each other! 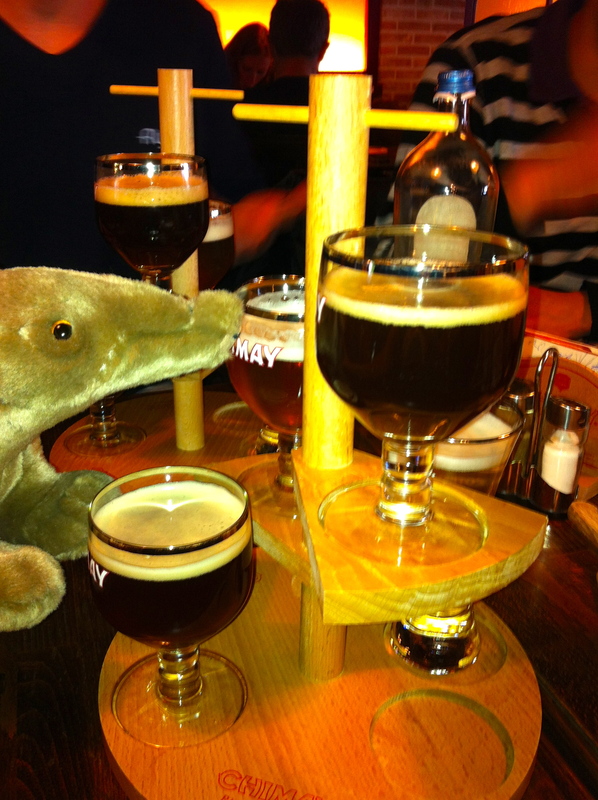 How neat- they have an aardvark-sized beer spiral! I must confess though, Chimay was maybe my least favorite of all the breweries we visited. The beers weren’t so good and the service was bad- even the French astronomer said so!- because of things like how they forgot Yvette’s order and it came almost an hour late and wasn’t even very good when it did show up. Plus La Trappe and Leffe had been a lot of fun so I was a little disappointed. 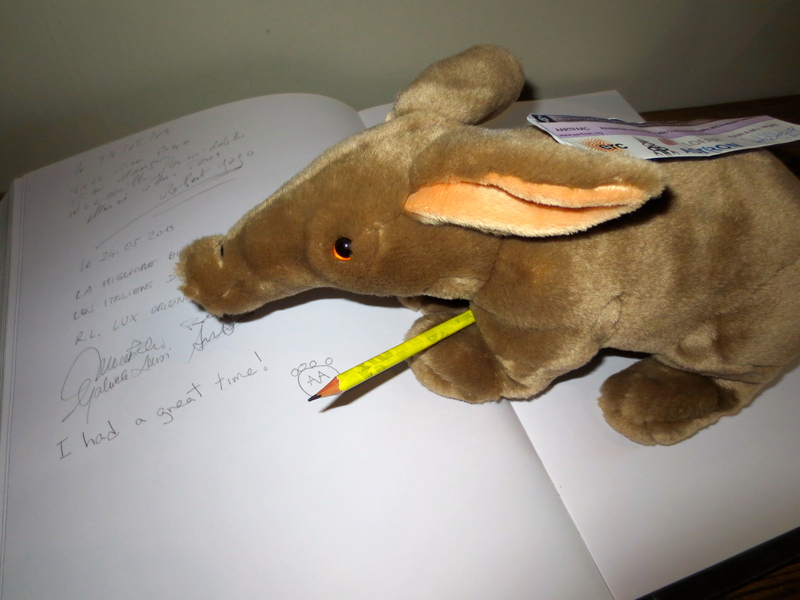 This entry was posted in Artie Aardvark's Adventures, Belgium. Bookmark the permalink. Thanks for the update, Artie, but I wonder that you have not mentioned any cute aardvark chicks. I’m sure they’d like to meet a guy like you with stars in his eyes. I’m getting worried that Artie might have a drinking problem. He always seems to be drinking a lot in photos. 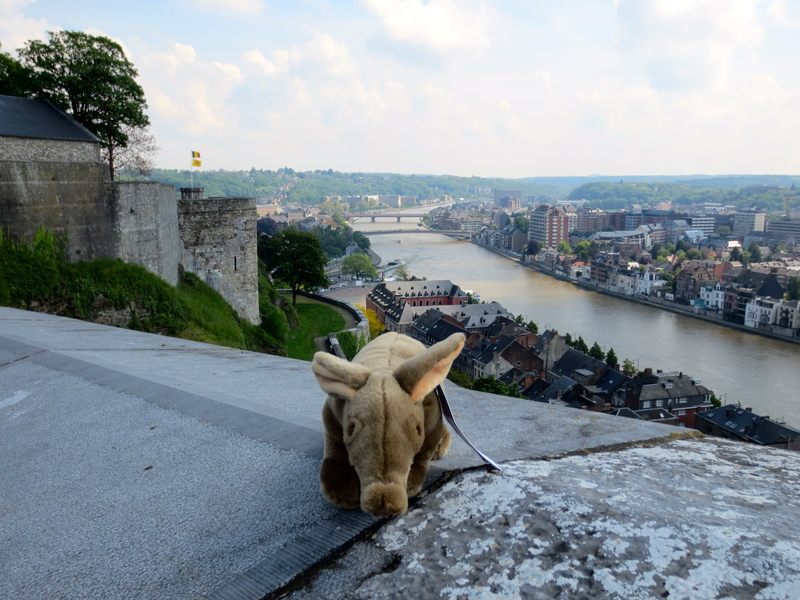 Pingback: Artie Aardvark’s Belgian Beer Adventure Continues | Where is Yvette? 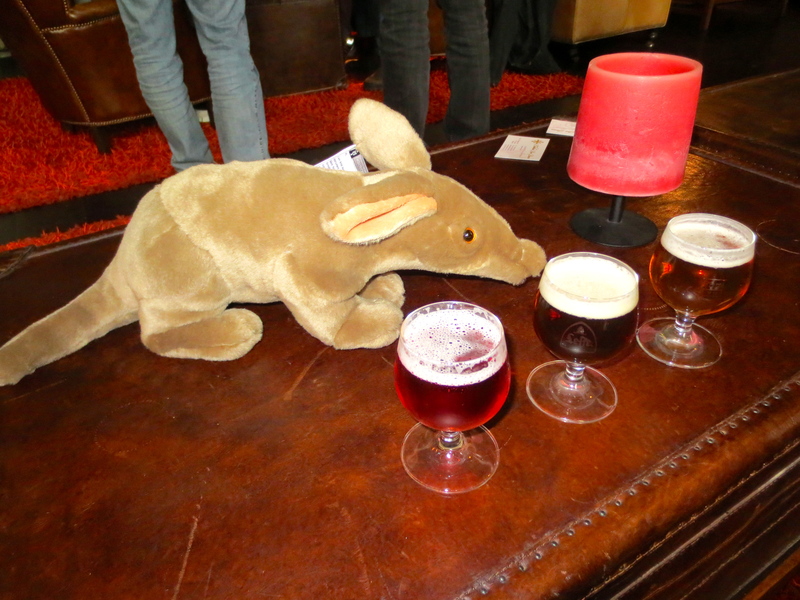 Wonderful looking beer and how can you not love aardvark photos!